The Christmas school holidays have already begun for our family. We have eight weeks to rest and recover from a full and happy year. These holidays my priority is to create lots of family fun while spending as little as possible. We have five children aged 10 and under and like many larger families have to be careful about our spending. I wrote a few months ago about our last fun, ‘cheapskate’ school holiday which only cost us $15 a day. We got off to a great start. Day one was devoted to swimsuit and shoe shopping for the three older children, which was funded by my mother. That evening I had planned to take them to meet friends at a park for a pre-Christmas get-together, but one of our lovely sudden summer storms put the kibosh on that and it was cancelled. We had our picnic dinner on rugs on the living room floor and surprised my husband when he got home. 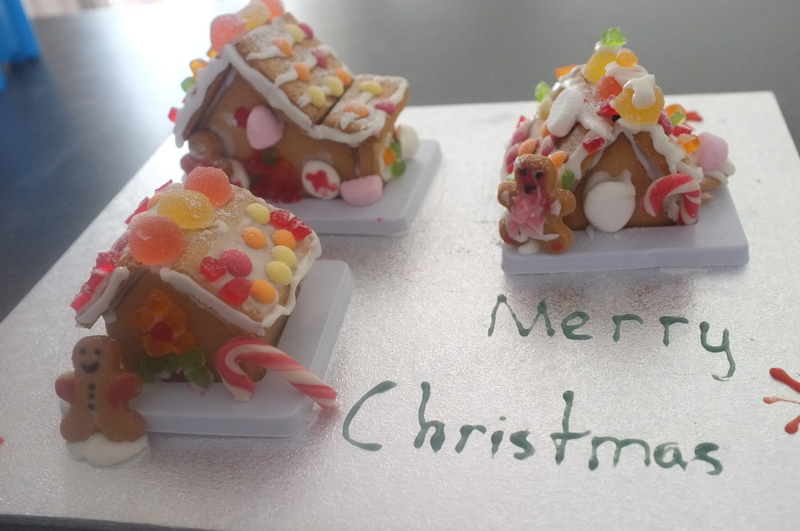 Day two involved getting the kids to put together and decorate a little gingerbread ‘village’ to take to a party with other families from their school. It rained again, so there were 50 or 60 people gathered in our friends’s not-huge house. It actually made for a really fun and lively party. As we finally rounded up our children to go home we found two of them jumping on the trampoline in the backyard in the rain. Ah, the joys of being young, huh? Yesterday we went to Mass and then the in-laws came over for a visit, the highlight of which was seeing our gorgeous one-year-old niece (and cousin), who gets cuter every time we see her. We ended the weekend at our neighbours’ place for dinner. By this I mean one or two things that everyone will get really excited about and look forward to. A lot of the enjoyment of a great experience often comes from the anticipation of it, and the memory of it afterwards – you can get such a lot of mileage from your dollars this way. This time we’ve got Christmas itself to look forward to and we’ve also booked to go on a week-long camp with some other families, which will be our one big expense these holidays. Having anchor events are important, because otherwise lots of little things alone can get kind of forgotten, and we end up feeling like we did nothing. We had a couple of years of not doing anything special during our long holidays and now I’m convinced that we need to get away for at least a few days, no matter how strapped for cash we are. We need the break and some time just devoted to leisure, and we need to create those happy family memories! Cooking. My 10 year old is starting to use the oven by herself, which is broadening the kids’ options beyond jelly and rocky road. She likes using this simple cupcake recipe and has requested cookbooks as Christmas presents. Gardening (we’ll get some more plants in, which will also knock something off my 40 things by 40 years list). We’ll put in fast-growing ones so the kids can get some fairly immediate gratification. Playing, making cubbies, dress ups etc. My eight year old donned a black cape and a freaky-looking mask and made an ‘evil lair’ yesterday out of a chair, bean bags and blankets. She sat in it for ages, occasionally slithering out to try to frighten one of her younger brothers. Doing craft. My kids love doing art and craft. Every Christmas my mother gives the children a huge pack of craft materials and this year she also wants to teach them do some simple sewing. Workshops and classes are expensive when you have five children, while willing grandmothers and/or tutorials on You Tube are free! Going for walks around the neighbourhood. Watching movies. We borrow these from the library or friends. Organising play dates. We’ll invite a few of the kids’ friends over and also accept invitations. Going to the library to stock up on books, CDs, and DVDs. Meeting up with friends at various parks. Going to free or cheap entertainment organised by our local council or shopping centres. The odd outing with an aunty and uncle, godparent, or grandparent. Next week I want to take the children into the city to see the special Christmas displays which is something we haven’t done before. With off-peak train tickets and some food and treats in a backpack it should be a fairly cheap outing they will enjoy. I’m fortunate to be able to attend a day-long retreat for women being held this week, which is being sponsored by the archdiocese so is practically free. A few friends will be there too. It makes me happier when I’m spending lots of time with my children if I get to spend some time away from them. I’m hoping we can get away at least by once ourselves to have a little dinner somewhere. Otherwise, we’ll just put the children in their rooms a bit earlier than usual with instructions that they can play quietly or read, so long as they don’t come and disturb our ‘date night’ in the living room. The children think this concept is hilarious and come to sneak a peek at us eating chips, drinking wine, and chatting, with our feet up. As long as they limit themselves to just poking their heads around the doorway a few times we pretend not to notice. Even simple holidays at home cost money. It’s much more enjoyable for everyone if we accept that fact and plan for it rather than stressing every time we have to open our wallets. What plans do you have in mind for your children to do these holidays? Will they be minimalist or lavish? Will you be doing it on the (relative) cheap like us? Next Post Oh Christmas tree! Thy leaves are so unchanging.